"Miracles are not contrary to nature, but only contrary to what we know about nature." The Anointing of the Sick is an occasion for those who are seriously ill, about to undergo an operation or are elderly, to experience the presence of Jesus. The awareness of that presence and the awareness of the prayers of the faith community give the anointed individual strength and assurance. Anointing means "to rub on" or "to smear", and in this Sacrament, a blessed oil or ointment is used as a sign of strength and blessing for the recipient. The Sacrament can be received as many times as needed. If you or a family member is diagnosed with a terminal illness, don't wait until the person is close to death to receive the Sacrament for the first time. Very often after receiving the Sacramental graces from God, the person will experience a great comfort, both physically and spiritually, and sometimes may even experience the miracle of a cure. Please call the Friary for one of the priests to administer the Sacrament of Anointing if your loved one is near to death. Are you in need of Anointing of the Sick? This special Sacrament is always available for the very sick, ill, or dying. Additionally, there are times during the year when an Anointing is offered as a part of the regular Sacrifice of the Mass. 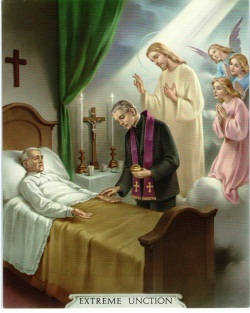 If you would like to celebrate the Sacrament of the Sick, please contact the parish office. For information about becoming Catholic as an adult, please click here.